Guy Bluford became the first African American in space on Aug. 30, 1983, aboard the Challenger on NASA's eight space shuttle mission (STS-8). Guion "Guy" Bluford is a former NASA astronaut who was the first African-American to fly into space. He flew four shuttle missions. "All of us knew that one of us would eventually step into that role," Bluford later told NASA about being the first. "I probably told people that I would probably prefer not being in that role ... because I figured being the No. 2 guy would probably be a lot more fun." Bluford's first flight — STS-8 aboard Challenger — soared into space on a rainy August morning in 1983. Thirty years later, Bluford joked he was surprised anyone bothered to show up given the terrible weather. "People came from all over to watch this launch because I was flying," Bluford said in a 2013 interview with NASA. "I imagined them, all standing out there at 1:00 in the morning with their umbrellas, all asking the same question, 'Why am I standing here?' "
Launch, however, was a memorable moment. The crew listened to audio of the ascent after they returned to Earth and discovered that somebody was laughing as they went into space. "We listened to it for quite a while to try and figure out who that was, only to come to the conclusion that it was me. I mean, I laughed and giggled all the way up. It was such a fun ride," Bluford added. Bluford deployed the Indian National Satellite (INSAT-1B) while in orbit. Other activities of the STS-8 crew included putting the Canadarm robotic arm through its paces and several experiments to see how space affects the human body, among other milestones. The shuttle landed safely Sept. 5, 1983. Bluford, however, was just getting started. Astronaut Guion S. Bluford and Aviation Safety Officer Charles F. Hayes get a unique perspective of the environment during a 1979 zero gravity flight. In the next decade, Bluford would fly three more times as a mission specialist aboard NASA space shuttles. His next mission — STS-61A, also aboard Challenger, in late 1985 — was so packed with things to do that Bluford's shift often needed help from other crew members to fix meals. The eight crewmembers were doing the first Spacelab mission, which was partially run under the German Space Operations Center — another first for NASA. "After the mission, [the Germans] invited us and our wives to Germany to attend a technical conference highlighting the results of our mission," Bluford recalled in a 2004 oral interview. "It was a proud moment for all of us as we learned the results of some of the experiments that we performed during flight. The trip also gave me an opportunity to tour Europe with the wife and show her some of the sights that I had seen while training there." Flights were interrupted after the Challenger explosion of 1986, and resumed in 1988. Bluford was next assigned to STS-39, aboard Discovery, in 1991, but a herniated disc just four months before the original March launch date (later pushed to April) threatened his status on board. "The NASA flight surgeons grounded me and indicated that I would need an operation to correct the problem," Bluford recalled. "There was some concern from the training folks that I might not be able to complete the training syllabus in time for the flight. [Commander] Mike Coats altered some of the responsibilities on the crew, so that I could be operated on and still make the flight." 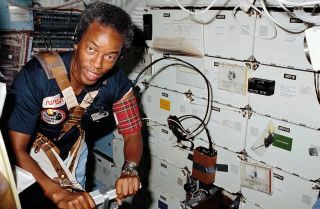 Bluford indeed made it, taking part in a mission that "gathered aurora, Earth-limb, celestial, and shuttle environment data with the AFP-675 payload," among other tasks, NASA stated in his biography. Bluford's last flight in December 1992 was primarily to release a classified payload for the Department of Defense. The U.S. government initially directed DOD to put more of its satellites on the space shuttle, but that changed after the Challenger explosion. DOD, however, still had a few flights left on the manifest — with STS-53, aboard Discovery — representing the last one. After landing, Bluford said he "had to seriously decide" what to do next, and felt it was time to leave the astronaut corps. He accepted a job offer in the private sector, but maintained some ties to the space program. Notably, he worked with the Columbia Accident Investigation Board that examined the fatal breakup of space shuttle Columbia in 2003. Since 2002, Bluford has been president and founder of The Aerospace Technology Group. On his LinkedIn profile, Bluford says the consulting firm "provides engineering support, business development, risk assessment, and engineering analysis in the development and application of innovative aerospace technologies to support government and industry needs." He also periodically gives public talks, such as one he gave at Rensselaer Polytechnic Institute in 2016 on flying in space, as part of a speakers' series on "how contributions from diverse scientists and thinkers can solve complex problems," according to the university.